Lately cashew milk and cashew cheese have made their way from specialty food isles to the more mainstream grocery stores. And this is fantastic news! The more people interested in discovering cashews, the more products and recipes we’ll find to experiment with. Cashew butter holds its own when compared to other nut butters in the health category. It contains about 5 g. of protein in 2 tablespoons and offers a good source of copper and magnesium — both minerals help with bone, muscle and joint health. Also, it has a good amount of iron and folate, which combined with its mostly unsaturated fat profile, makes it heart- friendly nut butter as well. Once Again has several recipes (found here) using cashew butter: dive in and fall in love with them, if you haven’t already! 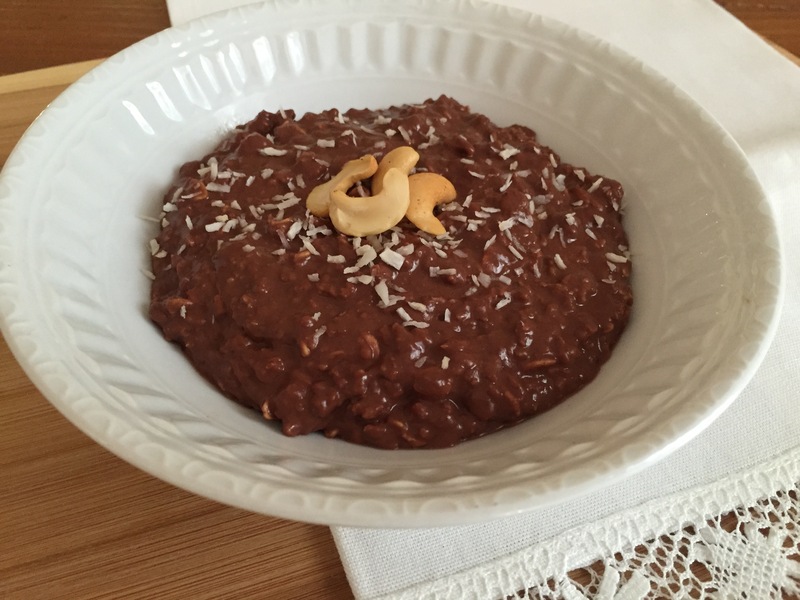 Here is another simple, easy and superb recipe using Once Again Organic Cashew Butter: Chocolate Oat Pudding. This recipe started as an oatmeal recipe but quickly turned into pudding. Adding creamy cashew butter makes it smooth and rich — just like chocolate pudding! There are two ways to prepare this delight, depending on your taste. Try both! Warm or cold: the warm way is quick and ready to eat right away, while the cold version involves the same process as overnight oats, that is, leaving the mixture in the refrigerator overnight. So you can eat this one as desert, or savor it on- the -go for breakfast. Add all ingredients to a jar with a lid (great time to recycle your Once Again glass jars!) and shake vigorously until all ingredients are well mixed. For the overnight oats- style version, just set the jarred mixture in refrigerator for at least 6 hours. For the ready- to -eat warm- style, transfer mixture from jar to sauce pan, and warm it up for a few minutes. The pudding will thicken as you cook it; for a creamy and thicker result, cook for at least 15 minutes. You may also use the microwave, as you prefer. If so, cook for 90 seconds, using that method. Garnish with coconut flakes and cashews. Cashew butter is also great in making vegan cheesecake or pumpkin pie! Going to try some of these recipes. This looks so good and is so easy, I want to make this!! I like making no-bake energy bars with cashew butter, too! Oh my! I will have to try this one for sure! Absolutely love all the recipes! I used Cashew Butter for my no-bake cookies and everyone went completely crazy for them, more so than normal. Making more this weekend. Just learning to cook with cashews. Thanks for the recipe. Oh this sounds so yummy!! Love Cashews and Thanks for the info! Now I gotta get me some cashew butter! Love cashew butter, this sounds delicious!! I have to try this last recipe, I LOVE cashew butter!! I’ve always loved cashews, and I adore cashew butter. This recipe sounds delicious! I would love to try the chocolate oat pudding recipe. I don’t know why I haven’t bought cashew butter. I do love cashews. I have the tendency to pick them out of a bowl of mixed nuts. LOL I better get myself a jar of cashew butter.